쇠북, 즉 금고(金鼓)란 글자의 뜻 그대로 청동으로 만든 북으로서 금구(禁口), 또는 반자(飯子, 半子) 등으로 불리는 절에서 쓰인 의식법구의 하나이다. 범종이 주로 아침·저녁의 예불이나 중요한 의식법회 때 사용된 것과 비교해 볼 때 금고는 공양시간을 알린다거나 사람을 모으는 등 그보다 단순한 용도로 사용되었다. 통도사에 소장된 내원사 금고는 뒷면이 넓게 뚫려 공명구가 형성된 일반적인 형식의 반자형 금고이다. 고면은 아직까지 두줄의 융기동심원으로 나누어 내구는 소문의 당좌를 그리고 그 외연에는 팔엽의 연화문을 변형시킨 화문을 섬세하게 장식되었다. 가장 바깥인 외구에는 네 곳을 돌아가며 유려한 운문을 장식하였다. 이러한 운문은 동아대박물관 소장의 대안원년명(大安元年銘(1085)) 반자의 운문보다는 훨씬 율동적이면서 도안화된 느낌이다. 특히, 고면의 구획이 아직까지 2구로 간략히 세분되었고 경암사 반자의 운문 형식을 그대로 계승한 11세기의 마지막 편년작품이면서도 섬세하고 유려한 문양이 잘 표현된 고려 금고 가운데 수작으로 평가된다. 측면에는 두 개의 고리가 부착되었으며 이 측면을 돌아가며 ‘大安七年辛未五月日棟梁僧貞妙次知造納金仁寺鈑子一口重二十斤印(대안칠년신미오월일동양승정묘차지조납김인사판자일구중이십근인’이라는 굵은 필치의 음각명문을 정연하게 새겨놓았다. 기록된 내용은 ‘대안칠년인 1091년 신미 5월일에 동량승인 정묘가 금인사에 만들어 시납한 반자 1구로써 이십근의 중량이 소요되었다’는 내용으로 풀이된다. 금인사의 소재는 분명치 않지만 고려시대 절로서 소장처인 내원암과의 관련을 유추해 볼 때 내원암의 원 이름이거나 근처에 소재했던 사찰로 추측된다. 아울러 명문에 보이듯 반자라는 표기가 쇠금변에 반자(반자)로 사용되어 경암사명 반자(1073)의 반자(盤子)에서 대안원년(1085) 半子에서 다사 명칭이 바뀌어 가는 고려시대 금고의 시대적 변화를 보여준다. 명문의 말미에 기록된 ‘印’자는 의미 없는 종결 어미로 고려시대 불교공예품의 명문에 많이 사용된 이두식 표기로 알려져 있다. 이 작품은 전체적으로 보존 상태가 양호하면서도 고면의 문양이 섬세한 수작인 동시에 손상 없는 명문은 고려 금고 연구의 귀중한 편년 자료가 된다. Also known as geumgu or banja, geumgo, literally meaning “iron drum,” refers to a bronze gong, a ritual object used in Buddhist temples. If temple bells were struck during the morning and evening services and other important rituals, the bronze gong was used for more casual purposes, such as to announce the hour of offering or call for a meeting. The Bronze Gong of Naewonsa Temple (currently in temporary custody of Tongdosa Temple) is in a style of a bronze gong with a hollow back. The front side of the gong is divided by two embossed concentric rings into three areas. The dangjwa, the circle in the innermost area, is left plain, and the immediately surrounding area is adorned with an intricate floral design that is a variation of the eight-foil lotus flower design. The outermost area has four elegant cloud motifs at regular intervals. This cloud design is much livelier as well as more stylized than the Bronze Gong with the Inscription of “Daeanwonnyeon” (1085) in the collection of the Donga University Museum. The Bronze Gong of Naewonsa Temple, although a late 11th-century work with a simple front, divided into three areas, and emulating the style of the Bronze Gong of Gyeongamsa Temple in its cloud design, is, nevertheless, an outstanding piece with graceful and detailed ornamental motifs. 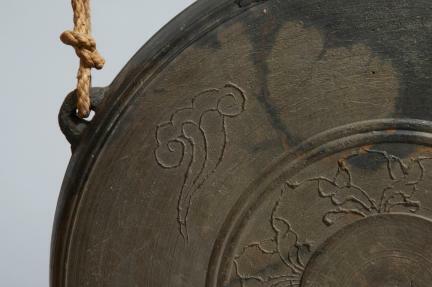 The gong has two loops attached to its rim whose surface also bears an incised inscription with characters in thick strokes. 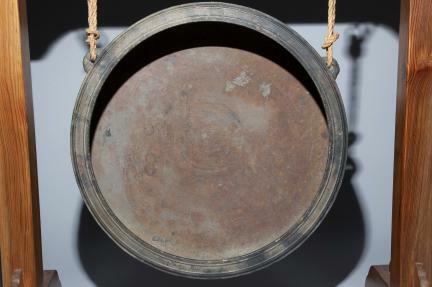 The inscription states that this bronze gong was made in Geuminsa Temple by Jeongmyo, in the fifth month of the Sinmi year (7th year of Daan), and that twenty pounds of bronze went into the making of this drum. Although the location of Geuminsa Temple is not precisely known, given that it was a Goryeo temple associated with Naewonam Hermitage where the bronze gong was housed, it may simply have been another name for the latter or may be a temple in the vicinity. 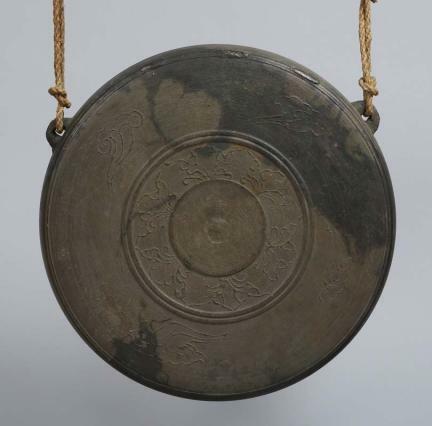 Meanwhile, the word banja, another name for bronze gong is written as “鈑子”; a transitional spelling between “盤子” in the bronze gong with the inscription “Gyeongamsa” (1073) and “半子” in the bronze gong with the inscription “Daesanwonnyeon (1st year of Daan” (1085). Finally, the character ‘印’ at the end of the inscription is a suffix without meaning used in idu writings, widely found in surface inscriptions on Goryeo-period Buddhist craftworks. This object, in an excellent state of preservation, is also remarkable for the beauty of its ornamental surface design and can be potentially useful for dating other Goryeo-period bronze gongs.